This was supposed to be the year USC’s Lane Kiffin figured it all out — then his team ran into Stanford again. I know that I’m not supposed to feel sympathy for Lane Kiffin. I assure you that I have received the missive loud and clear from the summit of Thunderhead Mountain, and I’m doing my best to comply. Last week, in the lead-up to the Stanford game, Kiffin attempted to bar a newspaper reporter from doing his job because he’d reported a rather pedestrian news bulletin about USC’s kicker undergoing knee surgery. This hardly seems like something worth drawing the ire of the national media establishment, but this is the Kiffin way: Just when you think he’s finally grown up, he manages to do something so clumsily bullyish that it nullifies any good will he may have built up. This was the year, I thought, that Kiffin would finally embrace maturity, but then a few weeks back he lured away the best player on a depleted program he’d offered to personally assist, after arranging to fly said player to Los Angeles on a booster’s private plane. And then he insisted that he would never vote the Trojans no. 1 in the coaches’ poll, and when it was revealed that he did, he unveiled some sort of convoluted logic about his team having fewer scholarships due to the years of probation from which it had just emerged, and then he gave up his vote altogether while deriding the lack of confidentiality involved in the process. I understand that there is something pathologically strange about Lane Kiffin’s relationship to human morality, and yet I cannot help myself: I still harbored a certain desire to watch his team succeed this season, if only because they looked so shiny and polished and downright pretty that it felt like a damned shame to see them scuffed at all. Saturday night, I stood under a rickety tent in Palo Alto and craned my neck around three television cameras in a vain attempt to hear Kiffin talk; most of what he said was drowned out by the din from Stanford Stadium, by the hundreds of future CEOs and defense secretaries and app designers who had flooded the field in the wake of Stanford’s 21-14 upset of the no. 2 team in the country. Someone asked Kiffin if he could ever have imagined this team would only score 14 points in a single game, and there was a notable pause in the proceedings. Kiffin was still wearing his white visor, because I like to think that he has several team managers whose job it is to rubber-cement the visor to his hair on game nights, and I couldn’t hear much, but I could see it in the body language, in the way Kiffin’s jaw dropped from its majestic heights and nearly rattled to the asphalt at his feet. I caught one phrase, and that one phrase was enough. Every time Stanford beats USC, it feels like something of a surprise, a jolt to the skeletal structure of both the Pac-12 and to the hierarchy of college football itself. In the Big Ten, Northwestern does not regularly defeat Ohio State (if they did, it would invoke a congressional inquiry from E. Gordon Gee), and in the SEC, Vanderbilt does not regularly defeat anyone because that’s the way folks like it; these highbrow institutions are thrown into the mix to balance the equation, to lend some credibility to the otherwise irredeemable exercise in hypocrisy we like to call college football. But it is now safe to say that Stanford owns USC: They’ve won this game four straight years. Every time it happens, it strikes most reasonable souls as an aberration that cannot possibly hold, but it felt especially so this year, because over a two-year span the Cardinal had lost their genius coach and then their genius quarterback to the professional ranks. And what were they left with? A second-year head coach named David Shaw, who possesses all the intellect of Jim Harbaugh but none of the blustery sheen, and a quarterback named Josh Nunes, who was once MVP of the Baseline League while at Upland (California) High School and hadn’t had reason to see much action since, because this is what happens when you play behind the best drop-back quarterback in college football since Peyton Manning. Pit that opposite this 2012 USC team: Against tousled blond quarterback Matt Barkley, who had foregone the rigors of professionalism for one final season as the most envied undergraduate in Los Angeles; against a pair of receivers, Marquise Lee and Robert Woods, who appeared to be as close to uncoverable as two college wideouts could ever be; and against tailback Silas Redd, who had been swayed by that private plane ride to abandon the rickety ship at Penn State and embrace the dark empire lorded over by Kiffin, a man who doesn’t require friends as long as he has a father to coach his defense. What Kiffin had assembled, while still trailing other schools in scholarships, was undoubtedly the most beautiful offensive football team in years,1 a squad that seemed an apt reflection of the city it represented. On a fourth-and-19 in Stanford territory in the second quarter, with his kicker’s injury now exposed to the world thanks to the vast overreach of the First Amendment, Kiffin chose to go for it; Barkley threw a short pass to Woods over the middle of the field, and Woods dodged approximately 17 tacklers and gained 24 yards, and then Redd plowed into the end zone to give the Trojans a 14-7 lead that I assumed they’d never relinquish. When the Cardinal required a touchdown with 10 minutes left in the fourth quarter, they turned to an onomatopoeic tight end named Zach Ertz,2 who streaked down the middle of the field and caught a 37-yard touchdown pass from Nunes. 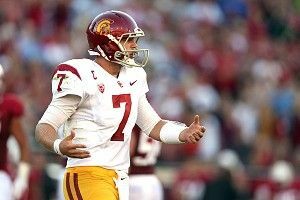 And from there on out, just when you expected Barkley to lead the drive that would force overtime and eventually win him the Heisman he had returned to college to claim, the Trojans looked ragged and undisciplined, a fact Kiffin noted afterward, apparently without casting any of the blame upon himself. Barkley threw behind Lee on a key third down, and by the time they got the ball back again there were not enough seconds to spare. On the last drive of the game, Barkley took multiple sacks until he had no choice but, in the waning seconds, to heave the ball 40 yards downfield, where it landed harmlessly a few feet from where I stood on the Stanford sideline. “Rhymes with Hertz,” according to the pronunciation guide I was given in the press box, which felt kind of like a veiled O.J. joke, given the circumstances. That’s when the students streamed out of the stands behind me, and the conflagration of subversive goofballs known as the Stanford band launched into the alma mater, and in a tent not far from where the celebration raged, Lane Kiffin confessed his surprise at the game’s results. I’m sure there were people across this land who reveled in the schadenfreude at that moment, and I’m sure there were others who recognized that USC could still regain its composure in time to save the season and make it to the national championship game in January. But I felt a certain measure of sadness in the midst of it all, because even if this was a bully that had been slugged in the mouth, that was one gorgeous bully. And it would never look quite that good again.